1 I said, I will guard my ways, that I sin not with my tongue; I will put a muzzle on my mouth So long as the wicked is before me. 2 I made myself dumb in still submission, I kept silence joylessly, And my sorrow was stirred. 3 My heart was hot within me; While I mused the fire blazed up; I spake with my tongue. 4 Make me, Jehovah, to know my end, And the measure of my days, what it is; Let me know how fleeting I am. 5 Behold, as handbreadths hast Thou made my days, And my lifetime is as nothing before Thee; Surely nothing but a breath is every man, stand he ever so firm. Selah. 6 Surely every man goes about like a shadow; Surely for a breath do they make [such a stir]; He heaps up [goods] and knows not who will gather them. 7 And now what wait I for, Lord? My hope--to Thee it goes. 8 From all my transgressions deliver me; Make me not a reproach of the fool. 9 I make myself dumb, I open not my mouth, For Thou hast done [it]. 10 Remove Thy stroke from me; I am wasted by the assault of Thy hand. 11 When with rebukes for iniquity Thou correctest a man, Like a moth Thou frayest away his gracefulness; Surely every man is [but] a breath. Selah. 12 Hear my prayer, Jehovah, and give ear to my cry; At my weeping be not silent: For I am a guest with Thee, And a sojourner like all my fathers. 13 Look away from me, that I may brighten up, Before I go hence and be no more. Protracted suffering, recognised as chastisement for sin, had wasted the psalmist's strength. It had been borne for a while in silence, but the rush of emotion had burst the floodgates. The psalm does not repeat the words which forced themselves from the hot heart, but preserves for us the calmer flow which followed. It falls into four parts, the first three of which contain three verses each, and the fourth is expanded into four, divided into two couples. In the first part (vv. 1-3) the frustrated resolve of silence is recorded. Its motive was fear of sinning in speech "while the wicked is before me." That phrase is often explained as meaning that the sight of the prosperity of the godless in contrast with his own sorrows tempted the singer to break out into arraigning God's providence, and that he schooled himself to look at their insolent ease unmurmuringly. But the psalm has no other references to other men's flourishing condition; and it is more in accordance with its tone to suppose that his own pains, and not their pleasures, prompted to the withheld words. The presence of "the wicked" imposed on his devout heart silence as a duty. We do not complain of a friend's conduct in the hearing of his enemies. God's servants have to watch their speech about Him when godless ears are listening, lest hasty words should give occasion for malicious glee or blasphemy. So, for God's honour, the psalmist put restraint on himself. The word rendered "bridle" in ver. 2 by the A.V. and R.V. is better taken as muzzle, for a muzzle closes the lips, and a bridle does not. The resolution thus energetically expressed was vigorously carried out: "I made myself dumb in still submission; I kept silence." And what came of it? "My sorrow was stirred." Grief suppressed is increased, as all the world knows. The closing words of ver. 2 b (lit. apart from good) are obscure, and very variously understood, some regarding them as an elliptical form of "from good and bad," and expressing completeness of silence; others taking "the good" to mean "the law, or the praise of God, or good-fortune, or such words as would serve to protect the singer from slanders." "But the preposition here employed, when it follows a verb meaning silence, does not introduce that concerning which silence is kept, but a negative result of silence" (Hupfeld). The meaning, then, is best given by some such paraphrase as "joylessly" or "and I had no comfort" (R.V.). The hidden sorrow gnawed beneath the cloak like a fire in a hollow tree; it burned fiercely unseen, and ate its way at last into sight. Locked lips make hearts hotter. Repression of utterance only feeds the fire, and sooner or later the "muzzle" is torn off, and pent-up feeling breaks into speech, often the wilder for the violence done to nature by the attempt to deny it its way. The psalmist's motive was right, and in a measure his silence was so; but his resolve did not at first go deep enough. It is the heart, not the mouth, that has to be silenced. To build a dam across a torrent without diminishing the sources that supply its waters only increases weight and pressure, and ensures a muddy flood when it bursts. 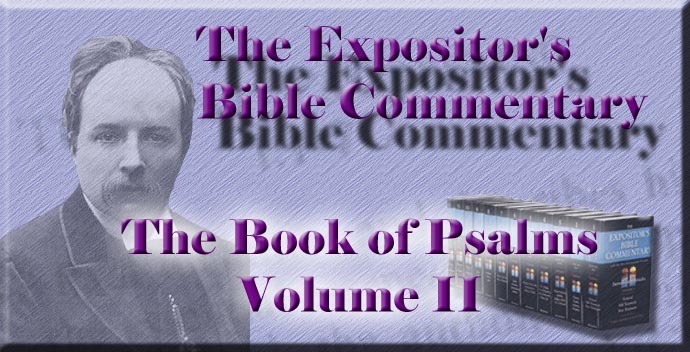 Does the psalm proceed to recount what its author said when he broke silence? It may appear so at first sight. On the other hand, the calm prayer which follows, beginning with ver. 4, is not of the character of the wild and whirling words which were suppressed for fear of sinning, nor does the fierce fire of which the psalm has been speaking flame in it. It seems, therefore, more probable that those first utterances, in which the overcharged heart relieved itself, and which were tinged with complaint and impatience, are not preserved, and did not deserve to be, and that the pathetic, meditative petitions of the rest of the psalm succeeded them, as after the first rush of the restrained torrent comes a stiller flow. Such a prayer might well have been offered "while the wicked is before me," and might have been laid to heart by them. Its thoughts are as a cool hand laid on the singer's hot heart. They damp the fire burning in him. There is no surer remedy for inordinate sensibility to outward sorrows than fixed convictions of life's brevity and illusoriness; and these are the two thoughts which the prayer casts into sweet, sad music. It deals with commonplaces of thought, which poets and moralists have been singing and preaching since the world began, in different tones and with discordant applications, sometimes with fierce revolt against the inevitable, sometimes with paralysing consciousness of it, sometimes using these truths as arguments for base pleasures and aims, sometimes toying with them as occasions for cheap sentiment and artificial pathos, sometimes urging them as motives for strenuous toil. But of all the voices which have ever sung or prophesied of life's short span and shadowy activities, none is nobler, saner, healthier, and calmer than this psalmist's. The stately words in which he proclaimed the transiency of all earthly things are not transient. They are "nothing but a breath," but they have outlasted much that seemed solid, and their music will sound as long as man is on his march through time. Our "days" have a "measure"; they are a limited period, and the Measurer is God. But this fleeting creature man has an obstinate fancy of his permanence, which is not all bad indeed--since without it there would be little continuity of purpose or concentration of effort--but may easily run to extremes and hide the fact that there is an end. Therefore the prayer for Divine illumination is needed, that we may not be ignorant of that which we know well enough, if we would bethink ourselves. The solemn convictions of ver. 5 are won by the petitions of ver. 4. He who asks God to make him know his end has already gone far towards knowing it. If he seeks to estimate the "measure" of his days, he will soon come to the clear conviction that it is only the narrow space that may be covered by one or two breadths of a hand. So do noisy years shrink when heaven's chronology is applied to them. A lifetime looks long, but set against God's eternal years, it shrivels to an all but imperceptible point, having position, but not magnitude. The thought of brevity naturally draws after it that of illusoriness. Just because life is so frail does it assume the appearance of being futile. Both ideas are blended in the metaphors of "a breath" and "a shadow." There is a solemn earnestness in the threefold "surely," confirming each clause of the seer's insight into earth's hollowness. How emphatically he puts it in the almost pleonastic language, "Surely nothing but a breath is every man, stand he ever so firm." The truth proclaimed is undeniably certain. It covers the whole ground of earthly life, and it includes the most prosperous and firmly established. "A breath" is the very emblem of transiency and of unsubstantiality. Every solid body can be melted and made gaseous vapour, if heat enough is applied. They who habitually bring human life "before Thee" dissolve into vapour the solid-seeming illusions which cheat others, and save their own lives from being but a breath by clearly recognising that they are. The Selah at the end of ver. 4 does not here seem to mark a logical pause in thought nor to coincide with the strophe division, but emphasises by some long-drawn, sad notes the teaching of the words. The thought runs on unbroken, and ver. 6 is closely linked to ver. 5 by the repeated "surely" and "breath" as well as in subject. The figure changes from breath to "shadow," literally "image," meaning not a sculptured likeness, but an eidolon, or unsubstantial apparition. and all the movements of men coming and going in the world are but like a dance of shadows. As they are a breath, so are their aims. All their hubbub and activity is but like the bustle of ants on their hill--immense energy and toil, and nothing coming of it all. If any doubt remained as to the correctness of this judgment of the aimlessness of man's toil, one fact would confirm the psalmist's sentence, viz., that the most successful man labours to amass, and has to leave his piles for another whom he does not know, to gather into his storehouses and to scatter by his prodigality. There may be an allusion in the words to harvesting work. The sheaves are piled up, but in whose barn are they to be housed? Surely, if the grower and reaper is not the ultimate owner, his toil has been for a breath. All this is no fantastic pessimism. Still less is it an account of what life must be. If any man's is nothing but toiling for a breath, and if he himself is nothing but a breath, it is his own fault. They who are joined to God have "in their embers something that doth live"; and if they labour for Him, they do not labour for vanity, nor do they leave their possessions when they die. The psalmist has no reference to a future life, but the immediately following strophe shows that, though he knew that his days were few, he knew, too, that, if his hope were set on God he was freed from the curse of illusoriness and grasped no shadow, but the Living Substance, who would make his life blessedly real and pour into it substantial good. The effect of such convictions of life's brevity and emptiness should be to throw the heart back on God. In the third part of the psalm (vv. 7-9) a higher strain sounds. The singer turns from his dreary thoughts, which might so easily become bitter ones, to lay hold on God. What should earth's vanity teach but God's sufficiency? It does not need the light of a future life to be flashed upon this mean, swiftly vanishing present in order to see it "apparelled in celestial light." Without that transforming conception, it is still possible to make it great and real by bringing it into conscious connection with God; and if hope and effort are set on Him amid all the smallnesses and perishablenesses of the outer world, hope will not chase a shadow, nor effort toil for very vanity. The psalmist sought to calm his hot heart by the contemplation of his end, but that is a poor remedy for perturbation and grief unless it leads to actual contact with the one enduring Substance. It did so with him, and therefore "grief grew calm," just because "hope was" not "dead." To preach the vanity of all earthly things to heavy hearts is but pouring vinegar on nitre, unless it is accompanied with the great antidote to all sad and depreciating views of life: the thought that in it men may reach their hands beyond the time-film that enmeshes them and grasp the unchanging God. This psalm has no reference to life beyond the grave; but it finds in present communion by waiting and hope, emancipation from the curse of fleeting triviality which haunts every life separated from Him, like that which the Christian hope of immortality gives. God is the significant figure which gives value to the row of ciphers of which every life is without Him made up. Blessed are they who are driven by earth's vanity and drawn by God's fulness of love and power to fling themselves into His arms and nestle there! The strong recoil of the devout soul from a world which it has profoundly felt to be shadowy, and its great venture of faith, which is not a venture after all, were never more nobly or simply expressed than in that quiet "And now"--things being so--"what wait I for? My hope"--in contrast with the false directions which other men's takes--"to Thee it turns." The burden is still on the psalmist's shoulders. His sufferings are not ended, though his trust has taken the poison out of them. Therefore his renewed grasp of God leads at once to prayer for deliverance from his "transgressions," in which cry may be included both sins and their chastisement. "The fool" is the name of a class, not of an individual, and, as always in Scripture, denotes moral and religious obliquity, not intellectual feebleness. The expression is substantially equivalent to "the wicked" of ver. 1, and a similar motive to that which there induced the psalmist to be silent is here urged as a plea with God for the sufferer's deliverance. Taunts launched at a good man suffering will glance off him and appear to reach his God. Ver. 9 pleads as a reason for God's deliverance the psalmist's silence under what he recognised as God's chastisement. The question arises whether this is the same silence as is referred to in vv. 1, 2, and many authorities take that view. But that silence was broken by a rush of words from a hot heart, and, if the account of the connection in the psalm given above is correct, by a subsequent more placid meditation and prayer. It would be irrelevant to recur to it here, especially as a plea with God. But there are two kinds of silence under His chastisements: one which may have for its motive regard to His honour, but is none the less tinged with rebellious thoughts, and brings no good to the sufferer, and another which is silence of heart and will, not of lips only, and soothes sorrow which the other only aggravated, and puts out the fire which the other fanned. Submission to God's hand discerned behind all visible causes is the blessed silence. "To lie still, let Him strike home, and bless the rod," is best. And when that is attained, the uses of chastisement are accomplished; and we may venture to ask God to burn the rod. The desire to be freed from its blow is not inconsistent with such submission. This prayer does not break the silence, though it may seem to do so, for this is the privilege of hearts that love God: that they can breathe desires to Him without His holding them unsubmissive to His supreme will. The last part (vv. 10-13) is somewhat abnormally long, and falls into two parts separated by "Selah," which musical note does not here coincide with the greater divisions. The two pairs of verses are both petitions for removal of sickness, either real or figurative. Their pleading persistence presents substantially the same prayer and supports it by the same considerations of man's transiency. The Pattern of perfect resignation thrice "prayed, saying the same words"; and His suffering followers may do the same, and yet neither sin by impatience, nor weary the Judge by their continual coming. The psalmist sees in his pains God's "stroke," and pleads the effects already produced on him as a reason for cessation. He is already "wasted by the assault of God's hand." One more buffet, and he feels that he must die. It is bold for a sufferer to say to God, "Hold! enough!" but all depends on the tone in which it is said. It may be presumption, or it may be a child's free speech, not in the least trenching on a Father's authority. The sufferer underrates his capacity of endurance, and often thinks, "I can bear no straw more"; but yet he has to bear it. Yet the psalmist's cry rests upon a deep truth: that God cannot mean to crush; therefore he goes on to a deeper insight into the meaning of that "stroke." It is not the attack of an enemy, but the "correction" of a friend. If men regarded sorrows and sicknesses as rebukes for iniquity, they would better understand why sinful life, separated from God, is so fleeting. The characteristic ground tone of the Old Testament echoes here, according to which "the wages of sin is death." The commonplace of man's frailty receives a still more tragic colouring when thus regarded as a consequence of his sin. The psalmist has learned it in relation to his own sufferings, and, because he sees it so clearly, he pleads that these may cease. He looks on his own wasted form; and God's hand seems to him to have taken away all that made it or life desirable and fair, as a moth would gnaw a garment. What a daring figure to compare the mightiest with the feeblest, the Eternal with the very type of evanescence! The second subdivision of this part (vv. 12, 13) reiterates the former with some difference of tone. There is a beautiful climax of earnestness in the psalmist's appeal to God. His prayer swells into crying, and that again melts into tears, which go straight to the great Father's heart. Weeping eyes are never turned to heaven in vain; the gates of mercy open wide when the hot drops touch them. But his fervour of desire is not this suppliant's chief argument with God. His meditation has won for him deeper insight into that transiency which at first he had only laid like ice on his heart, to cool its feverish heat. He sees now more clearly, by reason of his effort to turn away his hope from earth and fix it on God, that his brief life has an aspect in which its brevity is not only calming, but exalting, and gives him a claim on God, whose guest he is while here, and with whom he has guest-rights, whether his stay is longer or shorter. "The land is mine, for ye are strangers and sojourners with me" (Lev. xxv. 23). That which was true in a special way of Israel's tenure of the soil is true for the individual, and true for ever. All men are God's guests; and if we betake ourselves behind the curtains of His tent, we have rights of shelter and sustenance. All the bitterness of the thought of the brevity of life is sucked out of it by such a confidence. If a man dwells with God, his Host will care for the needs, and not be indifferent to the tears, of His guest. The long generations which have come and gone like shadows are not a melancholy procession out of nothing through vanity into nothing again, nor "disquieted in vain," if they are conceived as each in turn lodging for a little while in that same ancestral home which the present generation inhabits. It has seen many sons succeeding their fathers as its tenants, but its stately strength grows not old, and its gates are open to-day as they have been in all generations. The closing prayer in ver. 13 has a strange sound. "Look away from me" is surely a singular petition, and the effect of God's averting His face is not less singular. The psalmist thinks that it will be his regaining cheerfulness and brightness, for he uses a word which means to clear up or to brighten, as the sky becomes blue again after storm. The light of God's face makes men's faces bright. "They cried unto God, and were lightened," not because He looked away from them, but because He regarded them. But the intended paradox gives the more emphatic expression to the thought that the psalmist's pains came from God's angry look, and it is that which he asks may be turned from him. That mere negative withdrawal, however, would have no cheering power, and is not conceivable as unaccompanied by the turning to the suppliant of God's loving regard. The devout psalmist had no notion of a neutral God, nor could he ever be contented with simple cessation of the tokens of Divine displeasure. The ever-outflowing Divine activity must reach every man. It may come in one or other of the two forms of favour or of displeasure, but come it will; and each man can determine which side of that pillar of fire and cloud is turned to him. On one side is the red glare of anger, on the other the white lustre of love. If the one is turned from, the other is turned to us. Not less remarkable is the prospect of going away into non-being which the last words of the psalm present as a piteous reason for a little gleam of brightness being vouchsafed in this span-long life. There is no vision here of life beyond the grave; but, though there is not, the singer "throws himself into the arms of God." He does not seek to solve the problem of life by bringing the future in to redress the balance of good and evil. To him the solution lies in present communion with a present God, in whose house he is a guest now, and whose face will make his life bright, however short it may be.